AcPulse Steak Knives is Built with German 5Cr15Mov Stainless Steel. Which have high hardness and great anti-corrosion property.HRC57-58 hardness, the high hardness ensure the knives can stay sharp for long time. With quality gift box,very easy storage after washing and perfect for send to your friends as a present. Cut through your steak or meat easily with using these Pioneer Stainless Steel Steak Knives. Made of high quality stainless steel with a sharp serrated edge, they feature ergonomic handles triple-riveted for strength and durability.Suitable for use in family, steakhouse, bar, restaurant, makes a great gift presented for family and friends. A gorgeous wood construction provides this set with unmatched comfort and a precision grip. 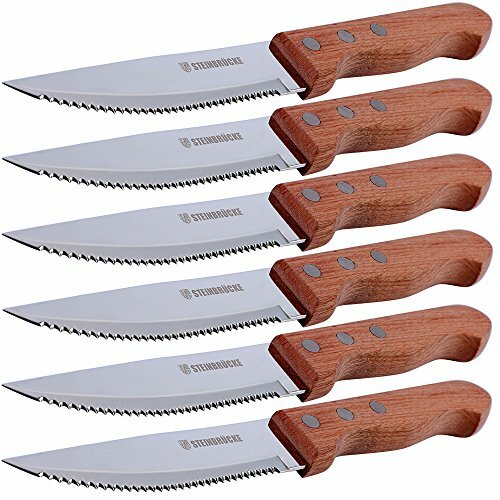 PACKAGE INCLUDES: 6-piece premium Polished rosewood handle steak knives and white gift box. Built with German 5Cr15Mov Stainless Steel. Which have high hardness and great anti-corrosion property. HRC57-58 hardness, the high hardness ensure the knives can stay sharp for long time. Serrated blade with proper sharpening angle enable the knife can slice the steak like a razor. Polished rosewood handle and polished knife blade, Every piece of the steak knives are built with fine processing. If you have any questions about this product by AcPulse, contact us by completing and submitting the form below. If you are looking for a specif part number, please include it with your message.